I live in a rural area and get my water from a well that is chock - full of minerals. It is safe to drink, but tastes awful and leaves mineral deposits all over everything. I have been buying drinking water since I moved in. The GoPure is wonderful. I haven't bought a drop of water since it came. 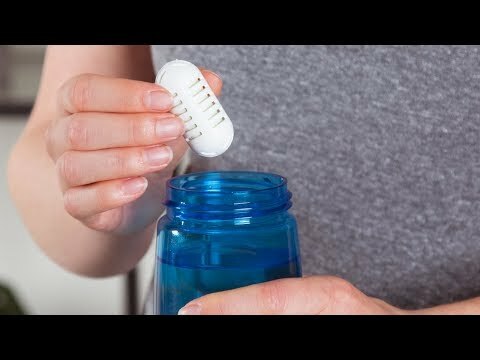 I had been using a nationally known pitcher with its filters, but the GoPure pod makes better tasting water and is less expensive to use than the pitcher or bottled water. For home drinking water I have several large glass jars I keep constantly filled with water, with these pods in them. I began using these pods after I'd become concerned that though the Britta pitchers I'd been using are BPA-free, they are not BPS-free. Though I found no claim that these pods are BPS-free, I feel that any BPS exposure levels are lower than that of Britta pitchers. Due to these not being able to claim BPS-free, gave 4 out of 5 grommets instead of 5. The water Purification Pod works great for me. Our well water has always tasted like some ones old used sock! We have a purification system installed yet the taste still remained. I have used all kinds of additives to help with the taste, most also have sugar not good. Now with this product, I can enjoy drinking the water again, and will be able to start losing those extra pounds too. This tiny ceramic water enhancer transforms the taste and freshness of tap water anywhere. Drop it in a water bottle, slip it in a pitcher for the whole family. It’s made from highly-porous ceramic that absorbs impurities and releases trace minerals to balance the pH levels of your water. Besides fixing alkalinity, each pod filters out lead, arsenic, chlorine, and other contaminants you don’t want in your system. It’s all in its Diatomite. This naturally-occurring, fine-grain rock has been in Earth’s waters for over 20 million years and has been used historically in different filtration systems. Using GoPure isn’t just softer on your body, it’s also good for the the environment. Instead of drinking from plastic water bottles, you can purify any potable water. That creates less plastic waste. Plus, the Makers donate 1% of their profits to planet-protecting organizations.